Total value of box is: $81. "Get ready for summer with this Vitamin Box! It’s a breakthrough in beauty because it delivers powerful anti-aging and skin and body firming vitamins deep down into skin! Vitamin enriched products in this Vitamin Box work together to revitalize, brighten and optimally hydrate deep into the skin and body so that you can have that sunshine glow! Vitamins A, C, D an E firm up the skin to support healthy collagen production, and re-energize exhausted skin by plumping up weak vessels under the skin to diminish the look of fines lines and wrinkles! This Vitamin-in-a-box is all you will ever need to preserve the youthful vitality of your skin! Don’t just pop in vitamin tablets! 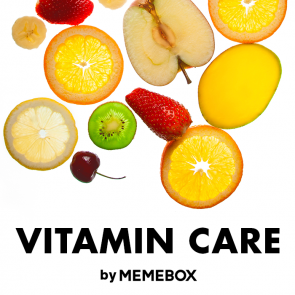 Pop open this Vitamin Box to vitalize your skin!" Memebox Product Description: "With pure vitamin C consisting over 30% of the facial ampoule, this is a highly concentrated vitamin ampoule which provides instant moisture, whitening care, wrinkle-care, and skin protection all in one!" How to Use: "Apply 2-3 drops of the ampoule and pat it in for full absorbance. MAke sure to shake the bottle well before application so that the vitamin capsules in the ampoule can be evenly applied over your skin." Memebox Product Description: "Amini is a brand that emphasizes 'enjoyment of natural affluence' within reasonable prices and strives to provide health-beneficial beauty products with only the best and natural formula. This Body Soap Bar works to rejuvenate the skin with its gentle and replenishing forumla consisting of vitamin-rich rosehip, lavender, and peppermint oils." How to Use: "Later the soap bar with water to create enough foams and gently massage it onto your face. Cleanse thoroughly with your fingers and rise off with warm water." Memebox Product Description: "Keep your hands germ-free with Pure Smile's citrus-infused Hand Gel. It's always easy to forget that our hands are the dirtiest part of our body with so many germs and bacteria going through without ever getting noticed! This super-cute Hand Gel is easy to carry around and the lovely citrus scent will refresh both your body and soul." How to Use: "Apply the Hand Gel on dried hands and pat it in until all's absorbed." Memebox Product Description: "Pure Smile's Gelee Labo series are facial packs with jam-like texture made from nutrition-rich fruits and they work to moisturize and soften the skin. The orange extracts, hyaluronic acid, centella asiatica, and licorice root extracts complex treats roughened skin texture and improve the skin elasticity." How to Use: "After cleaning, spread the pack evenly over your face, avoiding the eyes and teh mouth. Rest for 10-15 minutes and then rinse off with warm water." Memebox Product Description: "Made from various fruits rich in vitamin E, snail mucus extracts, hyaluronic acid, shea butter, and macadamia seed oil, this Lip Treatment delivers instant hydration and nourishment to dry, chapped lips." How to Use: "Apply a small amount of the lip treatment over your lips whenever necessary. It's highly recommended to use the lip treatment overnight as well." Memebox Product Description: "A smart vitamin-rich Sun Cream which guarantees UV protection, wrinkle care and skin brightening effects all in one! This gentle sun care products spreads smoothly onto the skin and absorbs quickly without being sticky at all." How to Use: "Take an adequate amount on your hands and apply it evenly over your face." Memebox Product Description: "Enriched with vitamin E, hyaluronic acid, and collagen components, the Juicy Point Pads are ideal for quick skin emergencies both on your face and on your body. These point masks will instantly soothe and moisturize irritated skin whenever and wherever needed, and plus they come in super adorable designs!" How to Use: "After cleansing, dry your face and stick on a point pad on irritated or dehydrated area of your face or body. Rest for 5-10 minutes, remove the pad, and pat in the remaining essence." Overall, an okay box only. This was one of the boxes that I didn't buy right away and only bought it when Memebox gave bonus Memepoints with purchase. At a higher cost of $29, the value only came out to $81, which is not too great. To me the only interesting in this box is the Elizavecca Real White Vita-Sauce. The sunscreen is useful, but the rest is just okay. This blog will be updated once I review the products. Check out my Current Memebox Promotions blog for coupon codes and current sales and my Memebox Page for a list of Memebox blogs and current/past Memeboxes for sale.